The whole purpose of my blog is to help people realize how easy it is to use Excel for everyday tasks. But it's come to my attention that in order to do that, I have to make sure people know the Excel basics! One thing I want you to remember, especially if you are brand new to Excel, is don't be afraid! Just like anything else, you get better with practice. Try things out, make mistakes, learn to correct them. And, of course, check out my blog for tips on how to do things easier and faster! If you have never used Excel before, I highly recommend watching this video. I walk through all the basics of opening and navigating through a spreadsheet. 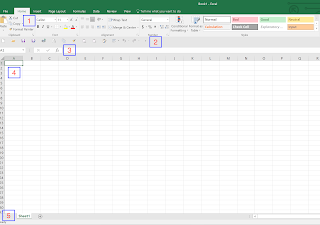 If you've used Excel before, and just need a reminder, here is a brief walk-through of what you'll find when opening a new spreadsheet. Workbook - Your entire file is called a workbook. Think of it like a spiral notebook. It's just a blank page where you can enter your data. Worksheet - Within your "spiral notebook" you have several pages. We call these individual pages worksheets, or tabs. The Ribbon - Excel created the Ribbon a few years ago as a new menu bar. The whole section at the top of your file where you see "Home," "Insert," etc. is the Ribbon. Here you will find almost any command you will want. Formula Bar - The next thing at the top of your file is the formula bar. In this bar is displayed whatever you have entered into your cell. It does not have to be a formula. When you enter data into your spreadsheet, you can type into this bar or you can type straight into your cell. Either one will work. Just make sure you pay attention to where it is showing up in the spreadsheet. Main Spreadsheet - And now we get into the meat of your file: your actual spreadsheet. Let's break down the pieces. Cells - The spreadsheet is made up of cells. You can enter anything you want in these cells: numbers, titles, notes, or even formulas that Excel will calculate for you. Note that because of the grid pattern of Excel, things that you enter will always stay lined up. Sometimes this is very helpful and sometimes it is a pain, but it will take lots of practice and use before you really get the feel for when those two situations happen. 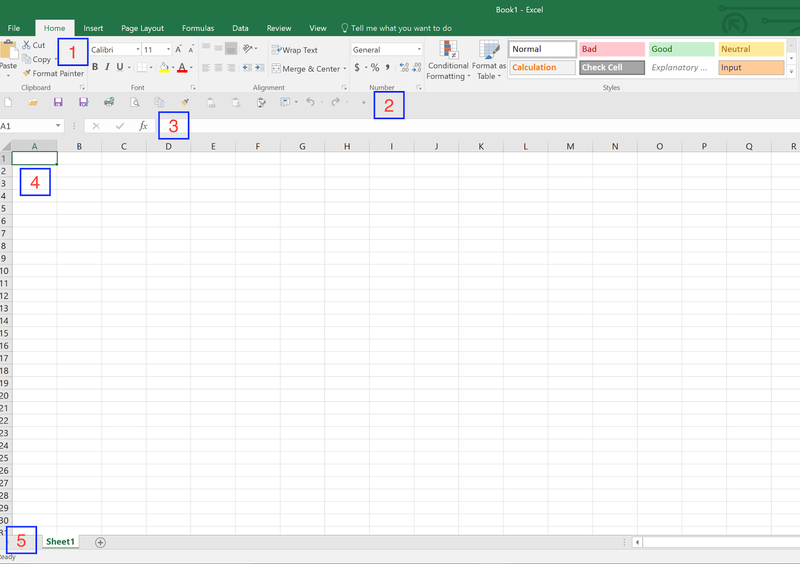 Rows - Rows are always numbered in Excel. The latest version allows for up to 1,000,000 rows, which is far more than you'll ever need for most spreadsheets. Columns - Columns are lettered in Excel. The latest version allows up to column XFD, which is over 16,000 columns. Again, this is far more than you'll likely need. Tabs - See at the bottom where it says Sheet1? This is your first tab, or Worksheet. Again, this is just like the first page in your notebook. You can change its name by double-clicking and typing your new name. Note that there is a 31 character limit, so the name can't be too long. You also can't name two sheets the exact same thing. If you need a new tab, just click the little plus sign or right click on the sheet name and hit Insert then Worksheet. Ta da! Now you have a new page in your notebook. Enter - Hitting Enter at any time moves you down one row in your spreadsheet. If you've typed anything into a cell, hitting Enter will store that information in that cell. Esc - Hitting Esc will clear anything typed in a cell without "storing it" and will leave the same cell selected. Arrow keys - Have the same effect as Enter and Tab, in that it will move one cell in the direction indicated and store whatever has been typed in the cell. I hope that helps you get started! Try some things out. Test what you can do. When you're ready, check out my other videos and tutorials for other ideas on what you can build with Excel. As always, if you have questions or are stuck, please send me an email at excelathome.blogspot@gmail.com.